On Sunday we had a birthday party with our family for my daughter with a theme of birthday games from around the world. The ideas were inspired from the book "Birthday's Around the World", which I stumbled upon at our local library. Come travel with us! We started the evening with the pinata from Mexico. Here is a detail of our pinata. 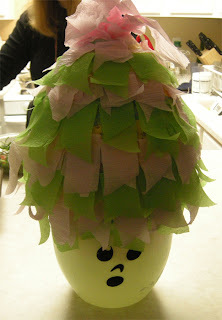 We used our ghost Halloween bucket while we were making it, and I love how it looks like a native headdress. We made it according to these directions. In retrospect, I have to say that $10 is a bargain for a pinata at the local party store. It took a lot of time to make it, although it was very easy. 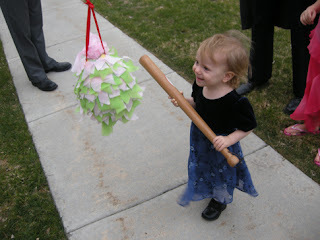 I will not make a pinata again until the children are old enough to help make EVERY LAYER. They loved doing the first layer, but I did the rest. Our last layer was made with torn construction paper. We covered it with crepe paper anyway, but it you are pressed for time, this is a good alternative. It looked pretty neat, and it would have looked even better if we had used more than two colors. My other tip is don't use whole wheat flour! We don't stock white flour in our home because we don't eat it, but using our fresh-ground whole wheat flour was a mistake. It started to spoil! The pinata was beginning to stink by the time we used it. It is a testament to the healthy properties of our daily bread, but next time I want to do a craft, I am going to use dead flour. My husband says that white bleached flour is also smoother and would have looked better as well. White flour and food coloring are good school staples, if not for eating. The pinata was a big hit (hehe). Michael said that when he went to Mexico on his mission, the pinatas were often filled with sugar cane. We couldn't find any at the grocery store and were dismayed that our local Mexican food store had been permanently closed. No sugar cane. Our pinata was filled with play dough and pencils. We ate Stir Fry and rice for dinner. I don't know how authentic it was, but everyone loved it. We also talked about Japanese Etiquette. From the Netherlands, we played a game called "Koephappen". You string a soft cookie and let members of the party eat the cookie blindfolded. For our version, we strung dental floss through ringed cookies from the grocery store. I have seen many variations of this game with donuts at church and company parties. 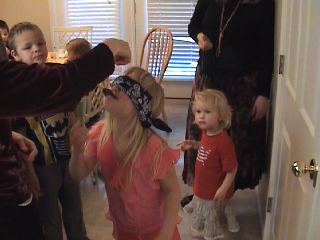 The children expressed concern in the beginning, but I assure you, everyone got their own floss! In New Zealand, they play a game where the children sit in a circle while music is played, and pass around a gift wrapped in tissue paper. When the music stops, the child holding the gift opens to find a small present and another wrapped gift. They keep the present and the wrapped gift continues to go around the circle until everyone has gets a present. We had a nice variety of fresh produce in our home, so we decided to wrap that, and we used left-over Christmas wrapping paper. It was weird having a wrapped gift in the fridge overnight! My daughter got a carrot and immediately started eating it. Yuck! I had not washed it beforehand. Oh well! 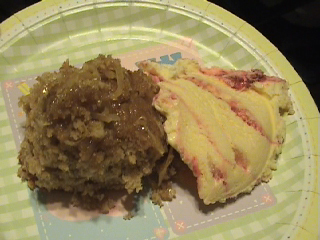 We ended with a favorite tradition from The United States of America, Cake and Ice Cream! We also sang the traditional birthday song. We asked my sister-in-law who is from Armenia what birthday traditions they have from her country, and she said that although they do have some traditional dances and songs, Armenia is becoming more like the United States in many ways. Cake and ice cream is popular there too. In fact, the whole world is becoming more "American-ized" in a lot of ways. Our birthday song is sung everywhere in the world, and our traditions are well-known. I suppose that if it means that there is more cake and ice cream in the world, we are happy to share our traditions, but today, we were grateful that the world could share its traditions with us. I am not a big fan of the early birthdays either. I just read the book and wanted to do the activities. Wrapping the produce was more time consuming than I thought it would be, but if you just get little trinkets and wrapped it in tissue paper with a rubber band, it would be faster. The pinata took a few hours over half a week to make. The others were quick and easy. Some of the other ideas in the book were harder to implement. For example, in Malaysia, they give presents in a red envelope to the birthday child. I didn't want to request that! Happy birthday, Caitlynn!